1) "The New Google Earth - Virtual Field Trips On Steroids"
2) "Google Classroom - Create, Assign, Collect, and Grade Student Work Paperlessly"
November 18 - 21, 2017, NYSCATE Conference 2017, (New York State Association For Computers And Technology), Rochester Convention Center, Rochester, NY; annual statewide technology conference for administrators, technology directors, teachers, technology integration specialists, etc. Google Lounge Large Group Presentation - For Google, Inc.
"Google Classroom - Create, Assign, Collect, And Grade Student Work Paperlessly"
November 19 - 22, 2016, NYSCATE Conference 2016, (New York State Association For Computers And Technology), Rochester Convention Center, Rochester, NY; annual statewide technology conference for administrators, technology directors, teachers, technology integration specialists, etc. Google Lounge Presentations - For Google, Inc.
May 21-22, 2016, EdTech Summit, (Featuring Google For Education), Guilderland, NY, two day event focusing on deploying, integrating, and using Google's GSuite For Education. 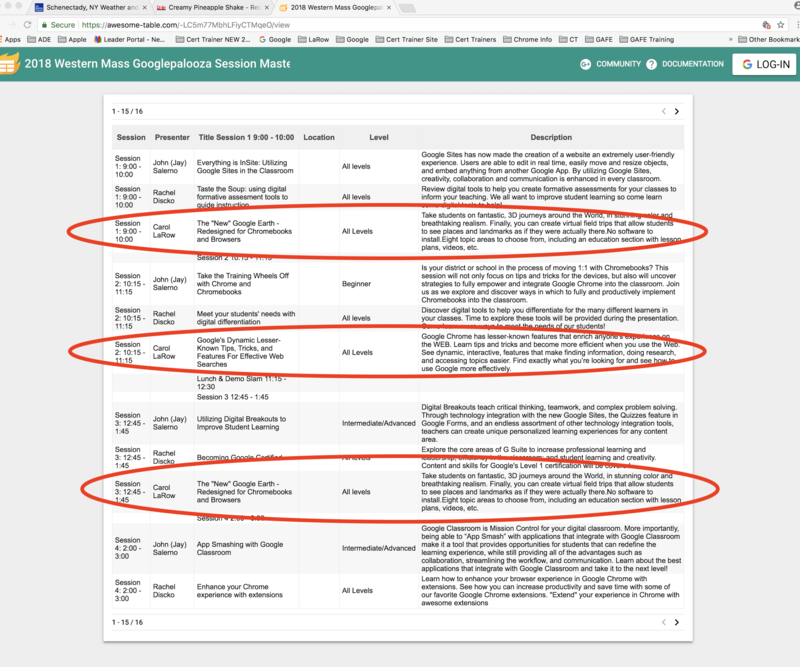 1) "Google Classroom - Assign, Collect, and GradePaperlessly"
2) "Dive Deeper Into Additional Features of Google Docs and Google Forms"
November 22 - 24, 2015 NYSCATE Conference 2015, (New York State Association For Computers And Technology), Rochester Convention Center, Rochester, NY; annual statewide technology conference for administrators, technology directors, teachers, technology integration specialists, etc. 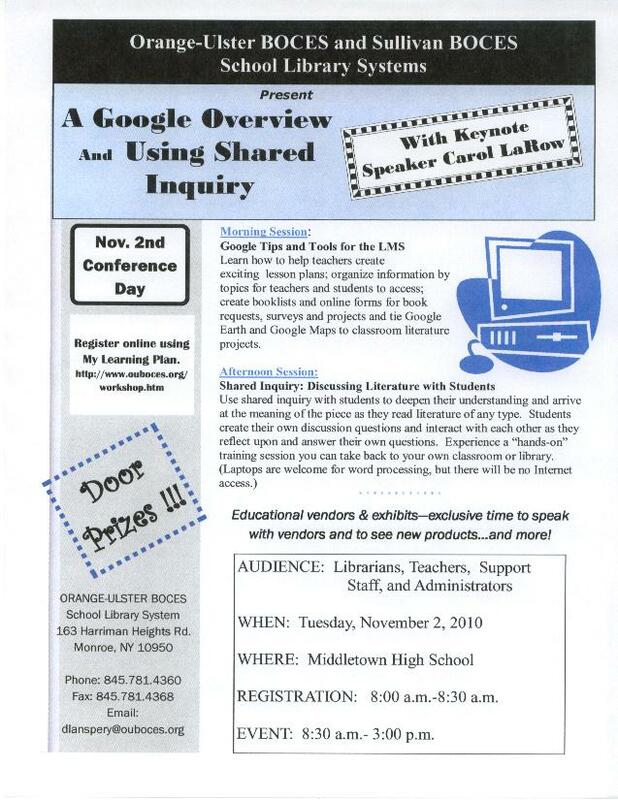 1)"Google Docs - Great Hidden Features You And Your Students Will Love"
April 24-25, 2015, EdTech Summit, (Featuring Google For Education), Albany, NY, two day event focusing on deploying, integrating, and using Google Apps For Education for K-12 educators. 1) "Go Farther With Google Forms - Learn Advanced Features"
"Work Smarter, Not Harder Using Google Apps"
November 24 - 26, 2014, NYSCATE Conference 2014, (New York State Association For Computers And Technology), Rochester Convention Center, Rochester, NY; annual statewide technology conference for administrators, technology directors, teachers, technology integration specialists, etc. "Google SITES - Classroom Webpages For Home/School Connections"
October 23 & 24, 2014, EdTechTeam Hudson Valley Summit, (Featuring Google For Education), Kings Elementary School, Warwick, New York; technology conference EdTech Team NY Google Summit; two day event focusing on deploying, integrating, and using Google Apps For Education for K-12 administrators, educators, IT departments, and librarians. "Paperless Classrooms With Google Sites, Docs, Forms, & Calendar"
"Cool Tips For Using Google Apps"
August 14 - 15, 2014, Maine Google Summit, (Featuring Google For Education), Yarmouth High School, Yarmouth, Maine; third annual statewide technology conference EdTech Team Maine Google Summit; two day event focusing on deploying, integrating, and using Google Apps For Education for K-12 educators. June 21 - 22, 2014, AppsEvents Connecticut Google Summit, (Featuring Google For Education), Greenwich Country Day School, Greenwich, Connecticut; statewide technology conference for K-12 and higher ed educators, staff, and administrators. 1) "Paperless Classrooms With Google Sites, Docs, Forms, and Calendar"
2) "Google's Dynamic "Lesser-Known" Special Features"
1) "Google's Dynamic Lesser-Known Special Features"
"Set Up A Paperless Classroom With Four Google Tools"
November 24 - 26, 2013, NYSCATE Conference 2013, (New York State Association For Computers And Technology), Rochester Convention Center, Rochester, NY; annual statewide technology conference for administrators, technology directors, teachers, technology integration specialists, etc. "Google: Using Docs , Forms, and Scripts For A Paperless Workflow"
"Google Docs And Forms For Public And School Librarians"
"Google Chromebooks In The Classroom"
"Using Google Docs and Forms Together - An Interactive Approach To Assignments, Learning, And Monitoring Student Progress"
1) "Interactive Teaching - Google Docs And Forms Together"
2) "Google's Lesser-Known Special Features"
3) "Customized Google Maps For Great Classroom Projects"
"Hands-On Google Tools Workshop For Public And School Librarians"
Assignments, Learning, and Monitoring Student Progress"
2) "Dynamic "Lesser-Known" Google Tools For Effective WEB Searches"
October 27, 2012, NYSSBA Annual Convention (New York State School Boards Association), Rochester Riverside Convention Center, Rochester, NY; annual convention for school board members and school superintendents. Presentation: "Google Apps For Education - Free Tools For A Safer Web Experience"
2) August 17th: "Create Customized Google Maps For Great Classroom Projects"
"Create Customized Google Maps For Great Classroom Projects"
1) "Create Customized Google Maps For Great Classroom Projects"
2) "Google Book Search, Book Lists, & eBooks - Awesome Tools For Everyone"
Learning, And Monitoring Student Progress." 4) "Google's Dynamic, Lesser-Known, Special Features"
5) "Google Earth - Fantastic Student Projects, Teacher Lessons, And LitTrips"
2) May 18th: "iPads Inside and Outside Of The Classroom - Wifi & 3G Uses"
"How Teachers And Students Use Google Apps For Teaching And Learning"
1) "Customized Google Maps For Great Classroom Projects"
2) "Google Apps For Education - For Teaching And Learning"
1) "Google Apps For Education - Using Google Tools In A Safe School Environment"
2) "Google Book Search, Book Lists, and eBooks - Awesome Tools For Everyone"
"Google Apps For Education - Using Google's Free Tools In A Safe Environment"
"Google Apps For Education - Free WEB 2.0 Tools For A Safer Online Environment"
"Creat Customized Google Maps For Great Classroom Projects"
"Google Tools For School Librarians"
"Google Tools For WEB 2.0 Teaching and Learning"
"Teacher And Student Projects Using Google Tools"
"Apple's iPhoto - Special Features And Classroom Projects"
"Google Tools For School Librarians - Valuable Educational Resources"
"A Google Overview And Using Shared Inquiry For Literature"
October 23, 2010, NYSSBA Annual Convention (New York State School Boards Association), Sheraton Hotel, New York City, NY; annual convention for school board members and school superintendents. 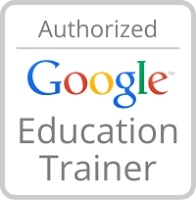 "Google Apps For Education - Provides A Safer Environment For Students"
2) "Google Book Search - An Awesome Tool For Everyone"
"Google Apps For Education - A Safer Environment For Students"
"Google Tools For Librarians, Teachers, and Students"
"Google Tools For Teaching and Learning"
"Using Google Maps For Literature And History Projects"
"Google Tools For The Social Studies Classroom"
"Google Tools - Innovative and Creative Collaboration Tools for Teaching & Learning"
Theme: "Connect, Collaborate, and Create in Your Classroom"
Presenation: "iPhoto '09 - See What's New"
1) "Google Tools For Engaging Lessons and Peer-To-Peer Learning"
2) "Google Tools - See The Latest Features For Teaching and Learnin"
1) "Google Tools For Schools, Updated - Part 1"
2) "Google Tools For Schools, Updated - Part 2"
October 15-18, 2009, NYSSBA Annual Convention (New York State School Boards Association), Sheraton Hotel, New York City, NY; annual convention for school board members and school superintendents. 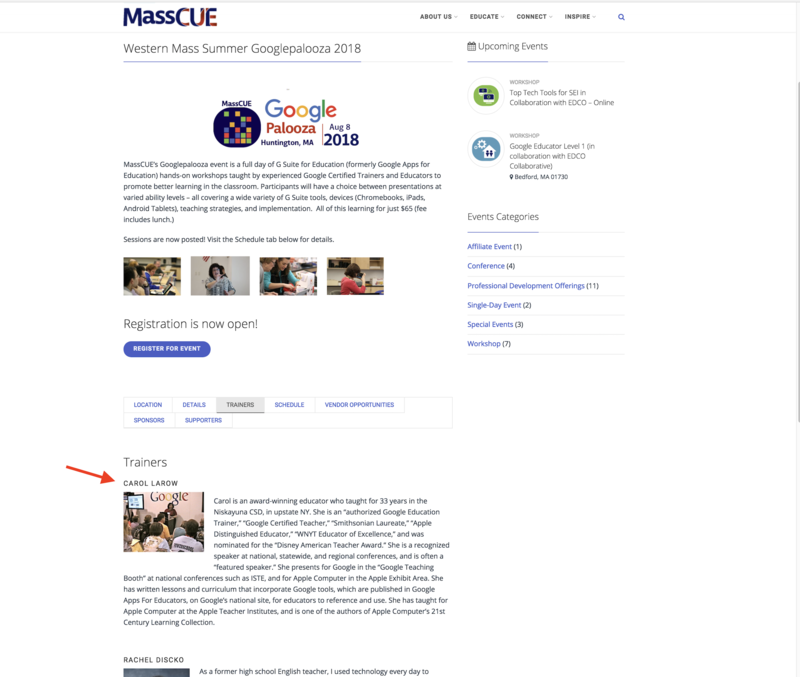 "Google's Tools For Adminstrators, Teachers, and Students""
• "Using Google Tools in the Social Studies/Civics Classroom- Part 1"
• "Using Google Tools in the Social Studies/Civics Classroom- Part 2"
"Google's Cool Tools - And, They're Free!" "Using Google Tools for WEB 2.0 Teaching and Learning - Part 1"
"Using Google Tools for WEB 2.0 Teaching and Learning - Part 2"
June 29 - July 1, 2009, NECC 2009 (National Educational Computing Conference), Washington, DC; national technology conference sponsored by ISTE. • "Google's Cool Tools for Schools - And, They're Free! - Part 1"
• "Google's Cool Tools for Schools - And, They're Free! - Part 2"
"Google's Cool Research and Collaboration Tools"
1) "Google's Cool Tools for Teaching and Learning, Part 1 - 3 hours"
2) "Digging Deeper - Google's Cool Tools for Teaching and Learning - 3 hours"
• "Google's Cool Tools for Teachers and Students"
• "iLife 08 - A Suite of Integrated Applications That Offer Digital Tools for Digital Learning"
1) "iLife 08 - An Apple Suite of Integrated Digital Tools"
2) "Podcasting With Apple's Garage Band"
1) "Google Earth - Makes A World Of Difference In Your Classroom"
2) "Google's Cool, New Tools For Schools, Part 1"
3) "Google's Cool, New Tools For Schools, Part 2"
"Google's Research and Collaboration Tools"
Featured Speaker: "Google's Cool Tools for Schools - And, They're Free"
October 16, 17, 18, 2008, NYSSBA Annual Convention (New York State School Boards Association), Sheraton Hotel, New York City, NY; annual convention for school board members and school superintendents. "Google's "Cool," New Tools for Schools - And, They're Free"
October 10, 2008, STANYS Conference (Science Teachers' Association of New York State), Siena College, Colonie, NY; conference for science educators. 1) "Google Earth & Google Sky- Make A World Of Difference In The Science Classroom"
2) "Google's "Cool," New Tools for Teachers and Students"
July 16-18, 2008, November Learning - BLC 2008 Conference (Building Learning Communities), Boston, MA; BLC is an international conference focused on teaching and learning; representatives from around the World & educational leaders attend this conference. "Personal Learning Environments for Collaborative Learning"
April 29, 2008, Connecticut Library Association 2008 Conference, Groton, CT; annual, statewide conference for public and school librarians. "Google Has Cool Tools, And They're Free"
March 19, 2008, MASSCUE Technology Leadership Symposium (Massachusetts Computer Using Educators), Westborough, MA; statewide symposium for superintendents, principals, technology leaders, & curriculum leaders. "Google's Cool, New Tools for Schools - And, They're Free"
1) "21st Century Learning with Technology - Leveraging WEB 2.0 Techniques"
2) "Cool Tools for Teachers and Students"
2) "Google's Cool Tools for Teachers and Students"
1) "Google's Cool, New Tools for Schools - And, They're Free "
"Google's Cool, New Tools for Teachers and Students"
March 16, 2007, Germantown CSD, Germantown, NY; keynote address to entire faculty; breakout sessions/workshops. Topic: "Best Practices - Successful Technology Integration"
Topic: "Student Based Projects and Technology Integration"
Topic: "Podcasting - The Portable Learning Tool"
"Student Success in the 21st Century - Authentic Learning Experiences in the Digital Age"
1) "Podcasts: Create with Apple's iLife '06; Access with Mac's and PC's"
2) "Exemplary Student Technology Projects for Today's Classrooms"
"iLife '06 - A Suite of Integrated Applications That Create Digital Tools for Digital Learning"
October 21 & 28, 2006, Bethlehem Central Schools Tech Camp, Bethlehem, NY; instructor for district-wide technology camp; tech offerings based on the principles of constructivism in teaching and learning. "Podcasting for Anytime, Anywhere Learning"
"Using Technology to Meet the Diverse Needs of Learners"
August 25, 2006, Horace W. Porter School, Columbia, CT; keynote address to entire faculty. "Emerging Technologies and Their Uses in Education"
August 17, 2006, The Association for the Protection of the Adirondacks, Niskayuna, NY; presented to executive director and director of operations; pairing Niskayuna Central Schools with the association and the community. Topic: "Protection of the Adirondacks, Student Involment, and Technology Integration"
August 3, 2006, Apple Computer & Northeast Regional Information Center - Podcasting Event, Albany, NY; speaker for Apple Computer's seminar on podcasting in education; presented two sessions entitled, "The Portable Learning Tool"
"Technology and Literacy in Today's Classrooms"
"Technology Enhanced School Environments and Learning"
"Integration Ideas for Today's Digital Classrooms - The Changing Paradigm"
1) "iLife 05 - A Suite of Integrated Applications That Create Digital Tools for Digital Learning"
2) "Best Practices - Exemplary Ideas from Real Classrooms to Create Powerful Environments for Digital Learning"
"Exemplary K-12 Technology Integration Ideas"; presentation and discussion on current technology integration practices in education; discussion of ways technology integration enhances instruction, addresses higher level thinking and decision making, includes content as well as technology skills, and address the Learning Standards. TSSA Standards for Administrators also addressed. "Cool Ways to Spice Up Your Power Point"
1) "Using Technology for Teaching and Learning- Exemplary Integration Ideas"
2) "Cool Ways to Spice Up Your Power Point Presentations"
"How Can Technology Enhance the Classroom Learning Process?" "How Do I Use Multimedia Projects for Authentic Learning?" 1) Keynote: "Students, Technology, and the New York State Learning Standards"
2) Workshop: "The Power of Sound - Creating Multi-track sounds for Multimedia Projects"
3) Workshop: "Planning Multimedia Projects for Students - A How To"
September 28, 2004 - Albany Institute of History and Art, Albany, NY: Navy Project, which won a Smithsonian Laureate Award in 2001, is on display as part of the Institute's Navy Exhibit. Over the course of 19 years, 2,500 Niskayuna students corresponded with 21,000 Navy sailors in the Persian Gulf. Exhibit is on display from October 2004 through February 2005. "The Digital Student and Technology Integration in Education"
May 3, 2004 - Albany Institute of History and Art, Albany, NY: presented our school project, done with the United States Navy, to directors and entire staff of Institute. The Navy Project will be part of an exhibit at the Institute on W.W. II, highlighting the United States Navy. "Best Practices - A Collection of Exemplary Technology Integration Ideas from Educators' Classrooms, K -12!" November 3, 2003 - Apple Solutions Seminar, Albany, NY: Worked with the New York State Apple Education team; presented features of iLife and ways to integrate in education. "iLife and Its Uses in Education"
2) "Technology Integration - Your Curriculum and Technology"
2) "Technology, Standards, and Learning - Pulling It All Together"
"Increasing Teacher Productivity with Technology - Some Great Ideas"
1) "How Can I Address the Learning Standards with IT?" 2) "Computers Make My Classroom Hum!" July 29 & 30, 2002 - New York Talks; conference for superintendents and principals across New York State; presented by the Magellan Foundation in conjunction with Bill Gates Grant for leadership development. "Technology, Standards, and Learning - Pulling it All Together"
May 22, 2002 - presented for Apple Computer, Inc. and the Northeast Regional Information Center, Albany, New York. At this event, NYSCATE and Apple Computer co-sponsored workshops for educators. Workshop title: "No Child Left Behind Act"
My Topic: "Best Practices in Education"
April 24, 2002 - presented for the New York State Legislature. Event: "The New York State Assembly Presents: The 2002 Education Technology Conference," in Albany at the Legislative Office Building; one of five educators asked to present to the legislators. Purpose: to show state senators and assemblymen/women how teachers are using technology in their classrooms. 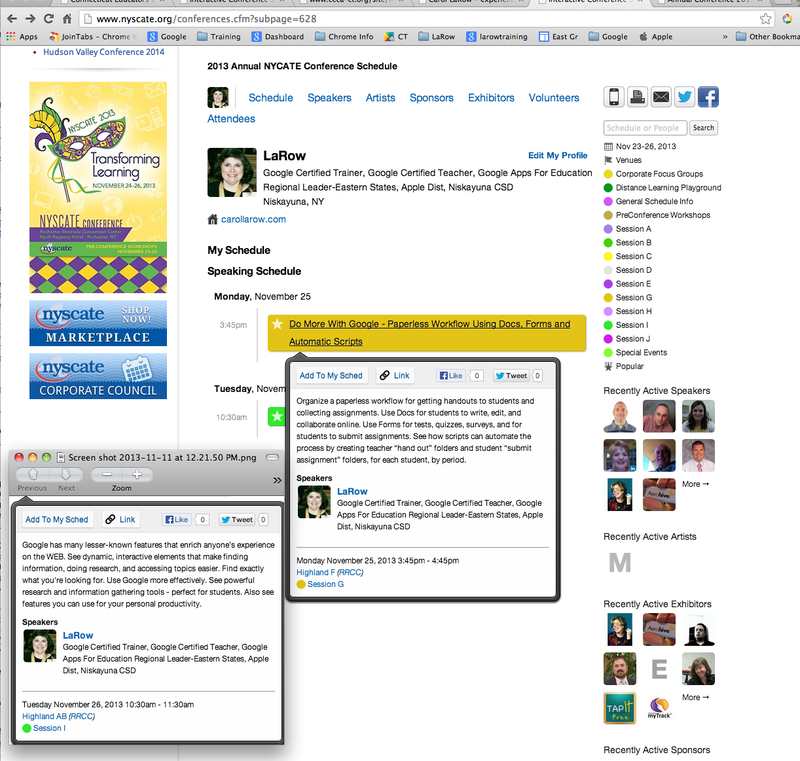 Topic: "Digital Video and the NYS Learning Standards"
Workshops and Inservice Training listed on separate page.